The Equity Investment Agreement is used when you are trading with another company your goods and/or services for an equity stake in their company. For example, if you are trading your development services for a percentage stake of preferred shares in a new startup. Proposal Kit Pro in my production company for years now and just last week I closed one of the biggest deal. Not only the proposal but also the contracts. The client had a big time Boston law firm review the contract and tell me that it was the most comprehensive and balanced agreement they had ever seen. The attorney whispered to me after that even without their small changes it was a solid contract and they would charge thousands of dollars to create the same. He then asked who was my attorney. Use this product once and it will pay for itself 10 fold." This Equity Investment Contract is included in editable Word format that can be customized in Word or by using the included Wizard software. How do you write a Equity Investment Contract document? 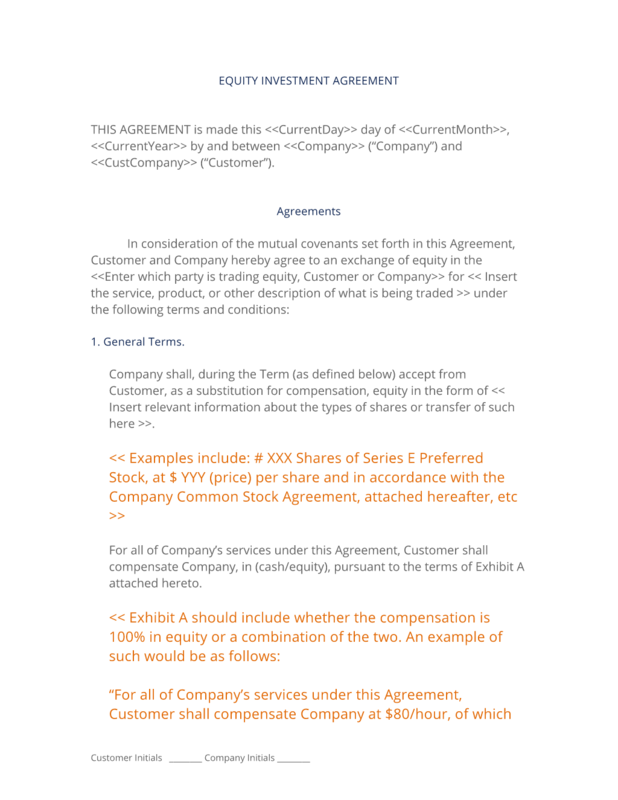 Company shall, during the Term (as defined below) accept from Customer, as a substitution for compensation, equity in the form of Insert relevant information about the types of shares or transfer of such here. Examples include: # Shares of Series E Preferred Stock, at $price per share and in accordance with the Company Common Stock Agreement, attached hereafter, etc. For all of Company's services under this Agreement, Customer shall compensate Company, in (cash/equity), pursuant to the terms of Exhibit A attached hereto. Exhibit A should include whether the compensation is 100% in equity or a combination of the two. "For all of Company's services under this Agreement, Customer shall compensate Company at $80/hour, of which $60 shall be made in the form of cash and $20 shall be made in equity in the form of stock. Insert relevant information about the types of shares or transfer of such here. Example: Shares of Series E Preferred Stock, subject to adjustment for dilution, in accordance with the Company Common Stock Agreement. Term of this Agreement shall commence on Start Date and shall continue in full force and effect until terminated by either party upon at least ninety (90) days prior written notice. Absent a termination notice, no event (except breach) may terminate this Agreement prior to End Date. Company will be reimbursed in cash for any expenses incurred in connection with the Services or work performed, subject to Customer's prior approval of such expenses. This Agreement shall be binding upon and inure to the benefit of Customer and Company and their respective successors and assigns, provided that Company may not assign any of these obligations under this Agreement without Customer's prior written consent. Company has no right to assign, sell, modify, or otherwise alter this Agreement, except upon the express written advance approval of Customer, which consent can be withheld for any reason. Customer may freely assign Customer's rights and obligations under this agreement. In the event Customer fails to make any of the payments set forth on Exhibit A within the time prescribed in Exhibit A, Company has the right to withhold Services, remove work product from Company-owned resources, or seek legal remedy until payment in full is received, plus accrued late charges of 1 1/2% per month. Both parties agree not to disclose to any third party the compensation terms contained within this Agreement. Neither party shall be held responsible for information that has been made available to the public as a requirement of the Company Common Stock Agreement. In the event any party to this Agreement employs an attorney to enforce any of the terms of the Agreement, the prevailing party shall be entitled to recover its actual attorney's fees and costs, including expert witness fees. The parties represent and warrant that, on the date first written above, they are authorized to enter into this Agreement in its entirety and duly bind their respective principals by their signatures below. The complete Equity Investment Contract - with the actual formatting and layout - is available in this Contract Pack.